The Elwha dam was constructed by the Olympic Power Company in 1913 for its potential to produce hydroelectric energy for Port Angeles but as the years passed, the costs to the environment, such as altering the migration patterns of local salmon and trout, became apparent, and in 2011 it was torn down. 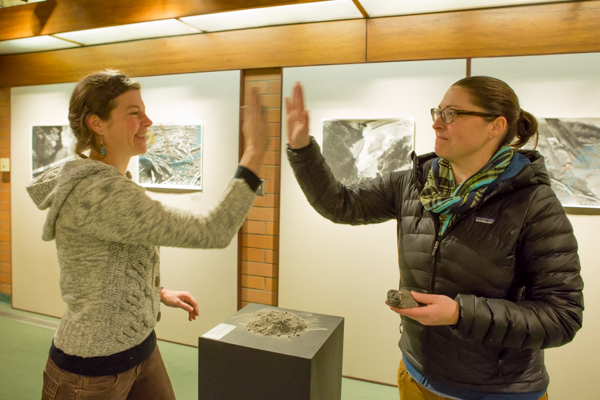 Claire Putney and Lauren Greathouse, photography instructors at SCC, put together an art exhibit in the Administration building on the Elwha river and its surrounding areas. Along with the photos contributed by the two artists, there are also samples of silt, clay, and driftwood from the area. Both Greathouse and Putney’s photographs show the Elwha river and its surroundings in black and white. Greathouse exhibits the environmental damage caused by the dam’s construction, while Putney’s feature the rushing water of the Elwha, overlayed by hand drawn maps, charts, and diagrams, connecting history and topography. Ebbtide: What inspired you to photograph the Elwha River? Greathouse: I didn't really get super inspired until I started hearing that they were going to take the dams down. I was already previously interested in a project called The Domesticated Landscape that had to do with man's effect on the landscape and it sort of funneled into this very specific thing where I was walking around photographing dams, and then when I heard that the dams were going to be taken down I was like, oh, this actually sounds way more interesting. Putney: I was living and teaching in California when I started researching dams... It was more an interest on environmental issues and social political issues that surround the control of resources. So, when I moved back up to Seattle in 2013, I was visiting Olympic National Park and I found out about the dams while I was out there. My sister and I went out a couple of times, and we photographed the Elwha. So when Lauren and I started teaching together, it came up in conversation one day that we were both photographing the Elwha and both were interested in creating the exhibit together. It was just very serendipitous and wonderful. Ebbtide: Why did you create this exhibit? Putney: Well, we were both researching it. We are artists, so we make things, we make photographs, we make drawings, we make sculptural objects. We make them to raise awareness but also to exhibit our work. It's just a natural progression of an artist, to research and create and exhibit. Greathouse: This was the biggest dam removal in world history when it happened. People weren't taking down dams, people were still building dams and still are and still will. But it's something important to know about, the culture of your own place. I think both of us are place oriented artists, so this is something that we felt people should know about. This is a river that, 100 years ago, was changed by these two dams in order to bring power into Port Angeles, but now it has the capability to go back to its natural form, it's natural place in the world. Ebbtide: Which is the favorite of each other's pictures? Greathouse: I like the one where (Putney) drew the dam in. I think it was "Untitled #6" and I like that one because it encapsulates the whole idea of getting to focus both on what's there now but also what used to be there as well. Putney: There was also another beautiful image that (Greathouse) took that shows the Aldwell reservoir. That was taken as one of her earlier images. It showed the stumps of trees that had been underneath all of the water for over a hundred years and covered in silt. It was kind of like a graveyard. They looked like tombstones to me. She captured it. That was exactly what I saw. That was my first experience of that place. Ebbtide: What are you trying to get across with your photographs? Putney: I never necessarily go into making anything with a specific outcome in mind, because we are human, we all have our own relationships with imagery. We all carry around our own baggage and experiences when we approach anything visual and we interpret it differently based on our experiences. It's more of my goal to always create an awareness of the subject. Greathouse: I am responding to a place and the way it is changing, the way the river is changing. The first time I made photographs in 2012 was right after they built the dams and when I go back there today I can't make the same photographs. It's totally changed. The alders are over our heads now. It's already changing so the capability of showing people that, what they are missing and what's happening is one of the wonderful things about photography. Ebbtide: What do you hope others will take from this exhibit? Greathouse: I hope they go up there. I hope they go up there and visit the park and see the history. They have done so much work making informational placards on both of the lower dam and upper dam sites. I just want people to go out there and see it. Putney: That's my hope, too, that the people see and the people are interested and go where the things are happening. There is so much happening socially and culturally surrounding that dam removal project. How people understand what is happening right on the other side of the Puget Sound is important to me.